Too many scientists defend the practice of not probing for loading controls for each protein gel. They say a "library" method perfectly suffices, when one separate loading control gel is run once for reference. Such sloppiness can sometimes be a hint of even worse practices taking place. Loading controls for western blots, what a boring topic. I have covered it before, in this article about the Austrian cancer and diabetes researcher Richard Moriggl. There seems to be a schizophrenic discrepancy between what journals expect of their authors, and what these journals are actually prepared to tolerate. The bigger problem however is that too many scientists don’t just ignore, but actively defend the practice of not probing for loading controls for each protein gel. They say a “library” method perfectly suffices, when one separate loading control gel is run once and then used as reference for all future gels with same samples. Loading control libraries became notorious in the research fraud affair around the plant scientist Olivier Voinnet, and even there certain journals can’t be bothered. It is just controls, who cares. There are many arguments against this sloppy attitude to loading controls, all listed here. One of them: how do you as Principal Investigator want to make sure that the result you ordered was not achieved by some “accidental” mis-loading of the gel? If you asked your team for a Western blot, in order to verify if a protein X is down-regulated after treatment Y, because this is the result you urgently need for the revision of your paper – how do you know the samples were loaded equally, if your loading control comes from a “library”? Certain controls are sometimes better left not done. It is a very slippery slope attitude, and I will show on the example of Moriggl and other biomedical researchers that it can lead to even bigger problems with data integrity. Some try to solve those by attacking the messenger. My earlier article covered several instances of papers from Moriggl lab at the Ludwig Boltzmann Institute Cancer Research and Medical University of Vienna in Austria. Two papers were corrected so far. In the correction of Mueller et al, Diabetes, 2017 the inappropriate loading controls were addressed, which were previously flagged on PubPeer by a reader of my site. It seems Moriggl, or rather his collaborator Jan Tuckermann at University of Ulm in Germany, (where the gels were done, according to my source) was not always able to provide the correct loading controls. Hence the authors simply replaced the figure panels with new data. Even now the corrected blots do not really match, or are presented improperly. 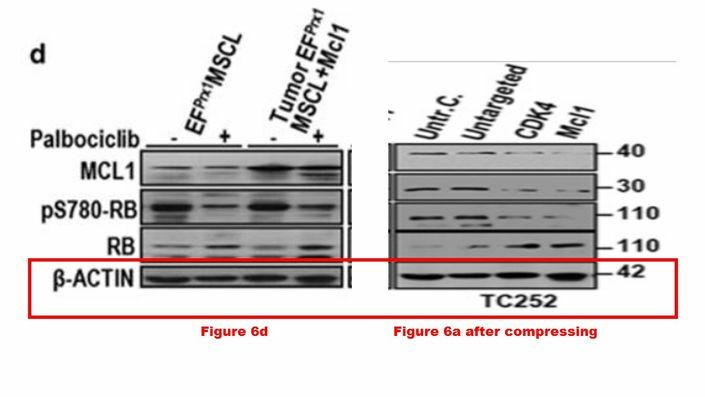 New gels in Figure 6E are hopelessly overexposed, neither blot background nor any baseline trace signal of phosphorylated AKT is visible (AKT-expressing samples without obvious phospho-AKT signal should at least show miniscule trace bands when residual signal is digitally boosted). This blot overexposure practice is not acceptable in 2018 anymore, when the images were submitted for correction. Also the total AKT gel for figure 2C is new, but it doesn’t match the old pS473-AKT blot, which remained. It is not a minor issue, because the first two lanes of that phospho-AKT gel also lack all traces of baseline signal. But at least there was a correction, which can serve as a warning. Other journals ignored the mismatched loading controls in Moriggl and Tuckermann papers. The gels were apparently not just accidentally duplicated, it was shrunk vertically and darkened, possibly to make it look different. This should have given the publisher cause for alarm and prompt Springer Nature to check the rest of the data for integrity. Apparently this didn’t happen. The gel bands look duplicated, after they were stretched, contrasted and put into a different experimental context. I notified the journal Cell Death and Disease about their failed correction. The academic editor Gerry Melino replied to me immediately, where he strengthened the suspicions of duplicated gel bands with his own analysis and announced to have already forwarded the case to the Ethical Committee with Springer Nature. Soon after, Journal Development Manager at BMC and SpringerOpen, Rebecca Pearce, wrote to me thanking for flagging my concerns and announcing an investigation. “The responsible (co)authors are informed and are clarifying the situation together with the journal/publisher. Maybe it is always worth it to take even allegedly minor issues like mismatched loading controls seriously. Who knows what else goes on in such labs. “Yup, once again the “loading control” police going after people who’ve probably done nothing wrong. We’ve been over this time and time again with Hoya, and it still hasn’t sunk in that this practice is generally considered acceptable. “Exchanging between them [loading controls, LS] is usually made by mistake and has no impact on the scientific results of the research. If one wants to point out concerns, better do it on the results rather than on the loading controls” [Harpochilus Phacocarpus]. That is actual intentional image data manipulation in Photoshop, a clear form of research misconduct by whoever did it. But then again, head biologist of French CNRS, Catherine Jessus, was acquitted in full for exactly same, the Sorbonne University investigation declared earlier this year such gel band copy-pasting to be good scientific practice. BethAnn McLaughlin, victim of my harassment? In late October 2018, when I raised on Twitter the issue of PubPeer evidence in some papers from the BethAnn McLaughlin lab at Vanderbilt University in Nashville, Tennessee, and how she replied to that, I faced the wrath of an indignated kangaroo court Twitter community. McLaughlin does certainly a very important job of raising awareness to the issues of sexual harassment in academia. Yet to me it was not clear why she dismissed the objectively real problems flagged in her papers as vengeful false accusations from accused harassers. Myself, I was described at best as a misogynist bully who conspires with sexual harassers to damage McLaughlin’s cause, a willing enabler of abuse of women in STEM, and at worst: I will never find out, but there were hints. The debate of whether loading controls should be run on the same gels or not, was led on Twitter with the background of whether I am a practising abuser of women myself. “Sadly, the person who is retaliating against me for reporting him for threatening to ‘destroy’ a student is bringing this forward into bullying my students as well. This is not what PeerPub is for. I suggest you read my blog on the hell this person put me thru here. Also, if you persist in harassing my students, I will go public with who you are. The first author, a former student of McLaughlin’s, uploaded original gel scans shortly after I raised on Twitter the issue with her advisor’s strange reply. It turned out, the splicing was indeed a minor issue, serving to remove the molecular weight ladder. PubPeer’s loading control integrity judge Leucanella Acutissima declared “Case closed”. But the two gel images, if one looks at the shapes of the bands and other hints, were unlikely part of the same gel. It seems, loading control libraries are apparently not an uncommon thing in the McLaughlin lab. “I am in the middle of a Title IX complaint with a faculty member who is being investigated for retaliation and harassment. He has clearly crossed a line and is now attempting to defame my student’s work. I stand by these studies”. “The A4-NP and A3-IsoP blots in the 2009 and 2011 paper are from the same experiment and are taken from the same membrane. The strip/reblot did not always come out well, so I ran all the samples in the same order on another gel in parallel and blotted for ERK, used this as the loading control for all of the other blots (in retrospect not the best practice, but hardly fabrication)”. “You state that the loading controls are duplicated in the JBC paper because they are for the same samples, but this does not appear to be correct according to the labelling of the blots. In panel B above the first ERK lane is the control for the LPS treated sample. However, in panel C the identical band is shown as the control for the non-LPS treated sample. 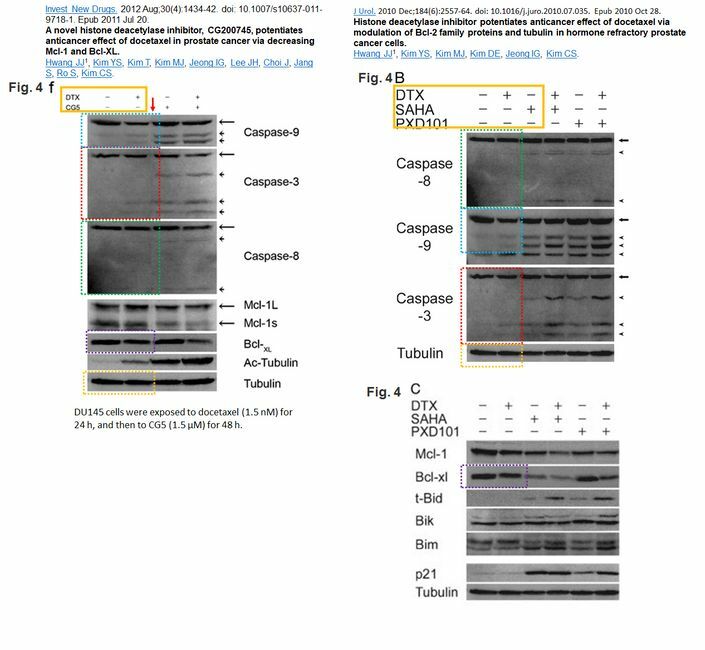 Regarding the image duplication of data between the JBC and the JNC paper, this was not done by you, but by a colleague to whom you sent the data. However, notice that the incorrect lanes were used. According to the original data that you have posted (I commend you for maintaining your data archives), the lanes published in the JNC paper are not for the treatment with 15-A3t-IsoP at 5uM and 10uM as stated in the article, but rather they are the identical bands from the JBC paper which are A4-NP at 1uM and 10uM. Again, the same loading control is also recycled from the previous paper”. [Pachyplichas Yaldwyni]. Some other images were re-used in other papers from McLaughlin lab, Zeiger et al Biochem Biophis Acta 2010 and Stankowski et al Antiox Redox Signal 2011, but she did not comment on that at all. Maybe it was just some controls, but even them, in fact especially the controls, must be taken seriously. Journals should insist that genuine controls are always shown. If not, they should run a disclaimer with the paper that goes something like: THESE AUTHORS HAVE BEEN EXEMPT FROM NORMAL STANDARDS BECAUSE THEY ARE GENIUSES AND WE ARE DESPERATE TO RUSH THEIR ONE-OFF DATA INTO PRINT. They should also insist that all probing, stripping, reprobing sequences are described in the figure legends and results (i.e. not hidden in obscure generic statements in the methods somewhere). Ditto for exact antibodies used and concentrations thereof. Exceptions: run disclaimer above. Papers without disclaimers should be fair game for the “loading control police.” And when caught, the penalty should be immediate retraction. There is of course no defense for collage blots like that travesty in the infamous “Homing T-cell” Nature paper. It’s absurd to label someone an abusive misogynist for asking perfectly reasonable scientific questions on their publication record. Do her supporters think she should be above scrutiny? Did she attempt to rein in the Twitter mob at all? Completely agree with Stuart. It is in itself a strong indicator of guilt if a person accused of scientific misconduct as their first action attack the accuser or starts talking about something else instead of the MATTER AT HAND the data integrity issues and what could explain them. Such a ‘create another fire’ strategy is classic of psychopaths or criminals and it stinks when a scientists behaves like this. A good clean scientist would always reply by investigation/data/explanation on scientific grounds, nothing else. Libraries of controls. One might as well just sign up for lifelong membership of the Museum of Creation and Earth History. It is strange that Diabetes, which is a high impact journal, still did not reconsider the issue of the “correction”.